Why do we always take things so personally? There are admittedly quite a few viable and valid answers to consider. But, the one Angel and I have found to be most common through a decade of one-on-one coaching with our course students and live event attendees is the tendency we all have of putting ourselves at the center, and seeing everything—every event, conversation, circumstance, etc.—from the viewpoint of how it relates to us on a personal level. And this can have all kinds of adverse effects, from feeling hurt when other people are rude, to feeling sorry for ourselves when things don’t go exactly as planned, to doubting ourselves when we aren’t perfect. Someone storms into the room in a really bad mood, huffing and puffing, and addresses us in a rude way. Immediately we think to ourselves, “What’s going on here? I don’t deserve to be treated like this! They should know better!” And we are left agitated, offended and angry. But the truth is the other person’s behavior has very little to do with us. They got mad at something outside the room, and now they’re reactively venting their frustrations in front of us. We just happen to be in the wrong place at the wrong time. This reality doesn’t justify their behavior, but it needs to be consciously acknowledged so we don’t waste too much of our mental energy positioning ourselves at the center of the situation and taking everything personally. Now, let’s assume for a moment that a person’s actions actually do seem to relate to us directly—we inadvertently did something that annoyed them, and now they’re reacting very rudely to us. A situation like this might seem personal, but is it really? Is the magnitude of this person’s rude reaction all about us and the one thing we did to trigger them? No, probably not. It’s mostly just a statement about this person’s reactions, snap-judgments, long-term anger issues, and expectations of the universe. Again, we’re just a smaller piece of a much larger story. And likewise, when someone else rejects us, ignores us, doesn’t call us when they said they would, doesn’t show they care, or flat out disrespects us… these reactions have much less to do with us than they have to do with the other person’s history of personal issues. We can learn to silently respect them and their pain without taking their words to heart. But, again, because we see everything through a lens of how it personally relates to us and ONLY us—a lens that does a poor job of seeing the bigger picture—we tend to react to everyone else’s actions and words as if they are a personal judgment or attack. Thus, other people’s anger makes us angry. Other people’s lack of respect makes us feel unworthy. Other people’s unhappiness makes us unhappy. And so it goes. If you’re nodding your head to any of this, it’s time to start gracefully deflecting the senseless negativity around you. When you sense negativity coming at you, give it a small push back with a thought like, “That remark (or gesture, or whatever) is not really about me, it’s about you (or the world at large).” Remember that all people have emotional issues they’re dealing with (just like you), and it makes them rude, rambunctious, and downright thoughtless sometimes. They are doing the best they can, or they’re not even aware of their issues. In any case, you can learn not to interpret their behaviors as personal attacks, and instead see them as non-personal encounters (like a dog barking in the distance, or a bumblebee buzzing by) that you can either respond to gracefully, or not respond to at all. When someone insists on foisting their hostility and drama on you, just keep practicing—reading your “notes to self” and being an example of a pure existence. Do your best to respect their pain and focus on compassion. Communicate and express yourself from a place of peace, from a place of wholeness, with the best intentions. But, also, don’t come down too hard on yourself when you slip up, which is inevitable. Even with decades of practice behind me, I sometimes catch myself being rude to people who are rude to me—I behave badly because they behaved badly. And even when the situation is absolutely their fault, my behavior only escalates the situation. So, I just do my best to take a deep breath, forgive myself, and reset my approach. Doing so always helps me make progress, even if it’s not instantaneous. Just keep forgiving yourself for the bad decisions you made, for the times you took things personally and lacked understanding, for the choices that escalated the situation and hurt others and yourself. Yes, just keep forgiving yourself, for being young in the mind and reckless sometimes. These are all vital lessons. And what matters most right now is your willingness to grow from them. As usual, M&A, you have shared some incredibly valuable insight in this post/email! All the notes connect together so seamlessly and I appreciate the added explanation of why we take things so personally. I never really thought about the fact that I “place myself at the center” of things so often…that really makes sense when I think about some of the stress I’ve had in my relationships recently. I can honestly think of a few times in the not to distant past when I focused on someone’s negative qualities and actions and then took them to heart, unnecessarily. So, although I’m still learning and growing in this area, your course, coaching and online teachings have guided me and allowed me to make gradual progress—I actually see it now. And this post/email helps me on that journey, too. I’m definitely less hot-headed and a lot more mindful than I used to be. Mindset is half the battle, and with steady guidance I’m mastering it more and more every day. Also, my daughter and I both pre-ordered your new book, and have it on our list to read together and discuss. Olivia, your progress has been inspiring to witness. Angel and I are cheering for you. And thank you so much for pre-ordering our new book. That helps us out tremendously. Another one of your blog articles dropped into my gmail inbox right when I needed to read it. I can absolutely relate to these notes to self, especially the ones that mention how calmness is a superpower. I agree that when we keep a calm mind, we tend to respond more effectively to the uncontrollable negativity, or the uncontrollable pain, around us. And that makes us more effective and loving listeners and communicators. Thank you for the kindness and for supporting our work by pre-ordering our new book, Vincent. We appreciate you. Love this post! I usually take things way too personally. I end up hurting myself and family I love in the process… and it’s usually over something so incredibly small. I WILL copy these and read and re-read them. I’m so glad I opened this post in my email first this morning. And I also just saw that I received the digital recording of your Think Better, Live Better 2018 conference. Can’t wait to dive in! Thanks for the kindness. Enjoy the TBLB 2018 recordings. They are fantastic. Angel and I have watched the guest speaker videos twice already. So many practical strategies to implement and perfect. Totally agree with you! I have to print this and read it every day! Thank you! Really needed! I really liked notes one , eight and nine. I could see myself directly in those situations. Wow! For some reason I just click into this article and it is exactly how I feel. I take a lot of things personally. I thought it was me! Because I feel passionate about doing things and care about it. Thank you! For this notes. Looking forward to keep reading about you and improve myself. Yeah, its absolutely correct. I used to think about what would other think about me in many aspects of my life, let it be my personal life or in career path. I have to start to think about myself more moving forward. Its all about “ME” after this. Thank you so much for the article, Mar and Angel. Thanks for publishing this. I have been saying this to myself and others for some years now. People are not so much out to hurt you as they are on their way to taking care of themselves. You just happen to be the thing or object on their way to getting what it is they are seeking. Yoy guys just did a better job of explaining it. Marc, great job! Thanks. I really needed this this morning. It was such a good read I laid in bed and thoroughly enjoyed every word… it was like new found fruit for thinking. Thanks again Sir. Continue to be a positive voice in this world. I use so many of your articles to help a women’s group I counsel once a week in our county jail. I usually make copies for them to keep & to remind themselves that they are always worthy and have control of their lives, and while they can’t control what others say about them, they have every reason to believe in themselves. Jail does not define who they are!! Thank you so much for all you do. You make a difference!!! Thank you for the selfless work you do, Julie. If sermons were like this, I’d still be going to church. Thank you for such an inspiring , freeing, meaningful passage that spoke to me personally, as I’m sure it did to so many others. You make a Difference. Great article. Came in at the right time for me as I had someone being rude to me last night…..and guess what I never reacted but realized it’s all about the other person. Thanks for your uplifting articles. Once again, you two have knocked it out of the park with this article. I can SO relate. Points 1, 4, and 5 personally resonate with me, when I reflect on recent events in a fairly new relationship and expressions of anger or irritation (and a hint of aggression) reacting to something I said, a suggestion I offered, or a question I asked. The relationship ended recently and despite missing the good parts, I value myself too much to be demeaned. Taking things personally is my daily process with this family. Thank you for your helpful posts. I am dealing with too much stress as a wife, mother, grandmother and caregiver to my 22 yr old, who is a traumatic brain injury. Your daily messages help me so much. Sheesh. I needed this really badly today. Oh, wait, I need it really badly EVERY flipping day. I have one particular relationship that I struggle with very, very badly in this regard. Freaking awesome post. Not that I’ll be likely to pull it off regularly, but I shall try. Try and try again, probably. We’re all beautiful, flawed, broken, amazing beings. This is one of your better blogs. Love it! Of course that might be because this time it was timely for me. Last week myself and two other senior management colleagues learned our roles had been eliminated because our boss had been planning a reorganization that was secretly much more dramatic than had been expected. 48 hours later we were packing or offices to make room for three new outside hires. While it was a shock I also approached the situation with the principles you outline here. It has given me the power to see it all as one big opportunity. On Saturday I applied for a great job I wouldn’t have even seen had this not gone down. On Sunday I decided to set up to drive for Lyft just for fun while I start planning for my next career move. You are right. How you react to adversity is a huge part of feeling good and in control. Good for you. Be not afraid. Explore this life and revel in where it takes you. Thank you Marc & Angel, you have broken down and simplified a very common human behavior. One which not only causes sleepless nights but also many ailments. I used to say I’m born sensitive. With time, I realized everyone is sensitive. We all internalize and process differently. Some lash out, others retreat, and then there are those who live in the drama of it all. Sometimes, we can walk away from a situation but when we live in situations from which we cannot walk away, it would serve us well to look within and learn from it. I will respond calmly with clarity or walk away peacefully. Wish you both many blessings. Thank you Marc and Angel for another great post. I am anxiously waiting for your new book. I really like #7 today. I was married to a covertly aggressive narcissist for twenty years who made everything a personal attack. I stayed with him so long because I didn’t take it personally. I still have to interact with him because of the school aged kids and their activities. But, now that he is mostly gone from my life, I really need to no longer let his behavior affect my thoughts. A great thing to replace those old negative thoughts is to notice things I like and then consciencely like that I like those things. For instance, I like the color turquoise. And, I like that about myself. In other words, I like that I like the color turquoise. So, now I am smiling and thinking positive thoughts about myself instead thinking about the stupid text message he just sent me. What a neat approach! I am very close to someone in almost the exact situation as you! Another case of thinking you are the “only one” going through this! Good luck to you! Number 10 was the one that hit me this morning since I have been trying for decades to get my wife to see me for who I am and understand what’s important to me in a marriage. Frustration and anger end up entering my head and need to realize that my needs are not important to her so it’s time to stop blaming and start living. When I became wheelchair-bound in 2010, I thought things couldn’t get any worse. Boy. I was wrong. Multiple sclerosis had stolen my ability to walk and my ability to see without a prism added to glasses so I could see the world without double vision. My vision is also so poor that I use a huge flatscreen TV for my computer monitor. It really did get a whole lot worse before it has recently started to get better (mentally). Have you seen the movie, Alice in Wonderland, where Alice is pressured to make a decision whether or not to marry a guy who has many dietary issues? She flees quickly from the situation and ends up falling down a rabbit hole. Her downward spiral got crazier and crazier until she clawed her way back up to get out of the hole. When I was diagnosed with multiple sclerosis in 2005. I took it personally that people didn’t know I was ill. Many people assumed I was drunk because I walked with a stagger. I was frustrated at the constant assumption of my drunkenness (I don’t drink), but I felt a sense of superiority when I made the declaration that I had multiple sclerosis. Their downfallen face at statement gave me a sense of satisfaction. Awful, I know. After much self reflection and desire to personally grow, I have become a different person. The decision to BE kinder and to BE happier, has led me to where I am right now. 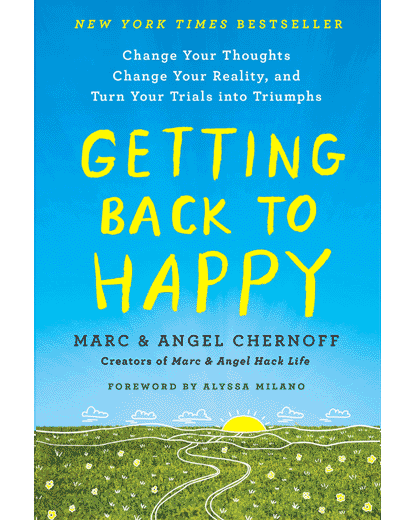 Thank you Marc and the Angel for your constant illustrations on how to think differently. There is now quite a range of words no longer in my vocabulary because of my efforts to change. I greatly look forward to reading the upcoming book. Beautiful and insightful, Rosalie. Cheers for continuing to build your inner resilience. Thank you for sharing this piece of your journey with us. I look forward to reading your posts every day as they are all so relatable to a greater or lesser degree. This post is especially poignant in that it has helped me understand and cope with the estrangement of my adult son. Although he insists that the self destructive problems of his youth are my fault, I now understand that this shunning behaviour is about him, not me. I can let go of some of the pain of losing him and focus on myself. He is doing what he thinks is best for himself and, as I accept that, I can focus on doing the same for myself. Going to save all those reminders. Sometimes others frustrate us beyond belief, but it is our problem not their’s. It is all about how you perceive life should be and it is not always as others believe it should be for them. When things go well, we expect them to continue and every once in awhile someone throws a monkey wrench into our well-thought out life and totally upsets harmony. If only we could control… but that is not ours to do so. You have to pick yourself up and brush off the negative and keep seeing the bright side of life. Whew! You guys said a mouthful here and all so real and true. As a person who is new to your site and newly practicing meditation and mindfulness I can say I am guilty of all of the above. Instantly reacting has been my style and I realize that its because I tend to take things personally most times. I guess I am highly sensitive but I am beginning to view that as very ugly. I recently pre ordered your book and am looking forward to it helping me to grow past these behaviors. Thank You very much for your insight and guidance. This is a new endeavor for me especially to be changing my behaviors/responses at 60 years old but I am determined to do so and to become a better, mindful, more compassionate and peaceful person. Thank you for your calming words. Things have been tricky recently with many serious issues occurring that have impacted on my life which sometimes leaves me with a variety of feelings ranging from sadness to anger. I am grateful for my wonderful life and and am so blessed with an amazing family and lifestyle but sometimes it is hard. I now have a new superpower Calmness! My grandchildren will be delighted they often ask what is my superpower and now I have one. I have ordered your new book and can’t wait for it to arrive. I receive your emails everyday and they are such a boost. Thanks again for your amazing service. Thank you so much. This was a wonderful read. I have put your “Notes to Self” in a Journal I read often. I know I will be reading them often for inspiration. I thank you and look forward to your emails every day . Thanks – I have a book I keep at my desk and I will add every single Note to Self. For over a year I’ve been the subject of gossip in my small office. It’s wearing me down because it does feel so much about me! I know I have an expectation of my coworkers – to NOT gossip! They just can’t stop and it makes the air weird and they sit so smug. I’ve never engaged and have tried to hope w time they would move on. I just kept being me – doing my thing – and in every other area of my job I do well and I know I’m helping our employees. So it doesn’t all feel hopeless. Today I’m on the verge of resigning, but instead, I will read these Notes to Self and see if it helps me. I think the example of the rude person entering the room and me taking it personally misses the point. I am not upset or offended because of what happened outside the room. I am upset or offended because he has failed to be polite and respectful to me. He is being rude. His rudeness is unacceptable regardless. We all have an obligation in civil society to be be civil to one another. I don’t think he is mad at me, or that I did anything wrong. I (and everyone else in the room) think that his failure to be polite is offensive just as shoving or cutting in line or stealing is uncivil. Its about him. Not about me. Sarah, we agree with each other, but we’re just looking at it slightly differently. His rudeness and anger is wrong, but it doesn’t have to become YOUR rudeness and anger. Another person can only infect you with their toxicity if you let them. The key is to remain calm, so you can then communicate and handle yourself (and their behavior) effectively. I just left a position working for a boss who is a raging narcissist. I tried so hard to make it work that I ended up clinically depressed. I am better now, and much better off in the new position. A lot of self-talk has been involved in my ongoing recovery. Notes 3 and 8 are my favorite. Hey col! You made the lust for the Firefox Pocket! I read this message earlier, and just saw it again on my list. This is one of the few blogs I try to read Every Day. Thanks for all the interesting, and thought-provoking information. I do agree with you guys — to a point. In those situations in which someone is in a bad mood, and we just happen to be there, I can see where that would not be personal. However…..this only holds up if the people who are taking their anger out on us are strangers. If, on the other hand, this is someone we know, and they are CONSTANTLY taking their frustrations out on us, then something else is going on. For one thing, WHY would this person be doing this to US specifically? The answer is that they see us as easy targets for bullying. Perhaps they can sense insecurities in us, and thus, we are vulnerable to their attacks. Some people who do this to us habitually — again, I’m not referring to strangers here — might be jealous of us, or see us as standing in the way of something (or someone) they want. There are other cases in which we are, indeed, justified in taking things personally. These are cases of domestic violence. Domestic violence is not always physical. It includes emotional and verbal abuse. It includes manipulation and gaslighting (a manipulative technique in which the perpetrator attempts to convince the victim that what they are seeing and experiencing is really a figment of their imagination). It includes subtle and overt putdowns of the victim. The purpose of all these things is CONTROL of the victim. Yes, this IS personal. No doubt about it. I can say this with total conviction because I was in an abusive marriage, and my husband did most of these things, except for physical violence. He came VERY close, though. On one occasion, he picked up a chair and made as if to throw it at me. On another, he drew his fist back as if he were going to hit me. Thankfully, he didn’t follow through on either occasion. And that was because abusers KNOW how far they can go with their victims. They ANALYZE their victims. In my case, my husband knew that, if he laid a finger (or an object) on me, I would not hesitate to have him arrested. This man abused me verbally and emotionally, nearly every day. Yes, we had some good times. However, there were more bad than good times. His verbal and emotional abuse was RELENTLESS. I was inept. I just NEVER did ANYTHING right. I spent too much money (he said this despite the fact that I was the one who worked and paid the bills). This man said the most HORRIBLE things to me. After that marriage was over, I had to go into extensive therapy in order to recover from it. AND, on top of all this, he CHEATED on me, and ALWAYS denied it. In fact, he would YELL at me at the top of his lungs if I DARED to confront him with evidence of his cheating. There are still other situations in which rudeness, criticism, and downright abuse ARE personal. I have encountered such situations in work settings. Like that job where my boss’s assistant was constantly on my case, constantly — and very rudely — reprimanding me. One day, I said to her, “If you’re going to talk to me with an attitude, please don’t talk to me.”. Her reply, which I will NEVER forget: “If you don’t want to be spoken to with an attitude, why do you take a job with no authority?” In other words, since I was not a manager or supervisor, I was FAIR GAME. I later found out that she was prejudiced against my ethnic group. Now, it’s MORE than evident that her constant abuse WAS, indeed, PERSONAL. She did not like the ethnic group I happen to belong to. As I mentioned above, sometimes people will abuse us because we have something (or someone) THEY want. That happened with a neighbor I later found out had been having an affair with my (now) ex-husband. Now, this was NOT a random stranger, but someone I saw on a regular basis. Whenever I saw her, I would greet her in a friendly manner. I would say, “Good morning”, or “Good afternoon”, “How are you? How’s your mom?” etc. She would ALWAYS make a huffing noise, and turn away from me. Right. BECAUSE SHE WAS SECRETLY BANGING MY HUSBAND. So, regarding the topic of “not taking things personally”, it all depends on the situation, and who is being rude, critical, or abusive. If it’s a random stranger, then yes, you can just take a deep breath, and try to brush it off. There’s one important point here, though. People who have been abused in their past will be triggered to take things personally MUCH more easily and quickly than those who have never been abused. This is especially true in the case of those who have not been in therapy in order to heal from the abuse. Reality is not as black and white as many people think it is. So, bottom line, in the case of “not taking things personally”, you really have to see what the circumstances surrounding the rude or abusive behavior is. Also, who is engaging in the rude or abusive behavior? If it’s someone you see on a regular basis, then there might very well be something really nasty behind this behavior. In such cases, one needs to sit up and take notice. In the case of a spouse who might be engaged in an affair, a frank discussion with said spouse is in order. From there, marital counseling is called for. If that doesn’t work, then divorce is the next step. In the case of a jealous co-worker or supervisor, one needs to see if it’s feasible to speak to someone in Human Resources. If this is not an option, then one simply has to update one’s resume, and start looking for another job. Sadly, sometimes the people who say and do hurtful things to us are our own family members. In some extreme cases, it might even be necessary to cut them off completely. It’s not unusual to hear of cases in which a woman steals her own sister’s boyfriend or husband. There are even cases of mothers who are very competitive with their own daughters, and do the same! These are the women who will constantly criticize and put down their female relatives, because said relative has a boyfriend or husband that THEY want. Obviously, this type of thing HAS to be taken personally. Let’s face it: some people are TOXIC. So they are to be avoided. We avoid toxic substances, don’t we? Well, the same goes for some people. Life is too short to be miserable. VERY TRUE. But sometimes, just “shrugging things off” doesn’t work, because the person behaving badly toward us has an AGENDA of some sort. And these are usually people we see on a regular basis, unfortunately. They are NOT random strangers. Cutting such people out of one’s life is the best strategy. Then, if necessary, one must have the courage and compassion toward oneself to enter therapy, and stick with it until one is healed. That will help to avoid triggering by random strangers. Thank you for this article, and for the opportunity to have my opinion heard. As I mentioned to Sarah above, we are in agreement, 100%. Obviously, this is just one article, that doesn’t cover every possible scenario. Physical abuse, for example, is absolutely an example of where you need to stand your ground. You know, I see Sarah’s point, as well. I think the key here is to see the difference between FEELING upset at someone’s behavior, and ACTING negatively in response. No one likes to have rudeness directed at them, for no reason. A professional attitude at work includes not flying off the handle at a customer. I think that any customer would tend to feel upset by such behavior. However, instead of snapping back, they can certainly seek out the manager and make a complaint. In the case of someone walking down the street, and roughly bumping you aside, you do have to shrug it off. As you say, one article can’t possibly cover any and all instances in which someone behaves in an objectionable manner toward us. I appreciate all of your articles, and will definitely check out the two links you’ve given me here. Thanks for the great reply! Have a TERRIFIC day! Beautiful! I’m saving your notes to share with my hypnotherapy clients (and myself)! I’ll use them as appropriate. Thanks for putting into words so many salient and helpful thoughts. Though I wish everyone didn’t take things so personally and were more respectful of each other, I can’t completely agree with everything you said. There will always be people who are hurtful towards you and even though their negativity may be coming from their upbringing, bad life experiences, etc, they still need to know it’s NOT ok to behave disrespectfully to others. People need to stand up to bullies sometimes. If we just ignore them, it’s not like the bullies will stop their ways. There are times they need a wake up call to know we live in a society, not in a zoo. Sometimes it’s’ only after they get a smack to the face that they realize they shouldn’t have acted the way they did. But as with everything, things should be taken in moderation. Don’t take things too personally, but don’t let people step on you either. I like what Max Ehrmann said in his famous Desiderata poem: As far as possible, without surrender, be on good terms with all persons. I think it’s more than just the difference between their behavior and our fantasy , it’s that we judge the difference. That’s the problem, yes? Also, it hurts to be judged only because at some level we agree with them. I don’t think anyone is to blame for what makes us feel the way we do when somebody pisses us off. We are the master of our emotions, thoughts and actions. If we assume that we are okay, but it is ‘them’ that has the problem, then we will never get it and walk around with an attitude of holier than thou. I think that the person who is upset is the one who has the problem. Thank you very much for this article. I needed to hear these things today. Lately I have felt at my wits end. I have taken a lot of stuff personal and reacted to it and this has created a very toxic environment. I appreciate the advice. I want so hard to not react when I feel wronged or disrespected but I find more times than not I react and I always later regret that. I want to be a better person everyday and always come from a place of love. I am really struggling right now. I very much appreciate the notes to self I will be using them daily. I was just thinking about how much suffering I generate by placing expectations on people’s actions and feeling hurt when the do not behave in a situation as I believe they should. I then stumbled upon your post and gotten a big picture view of this whole process. Thank you for your commitment to others!